This olympic white G&L Comanche has an acoustically tuned semi-hollow swamp ash body with those wild lookin' Z-Coil pickups. Hardware includes G&L's own dual fulcrum bridge and locking tuners. 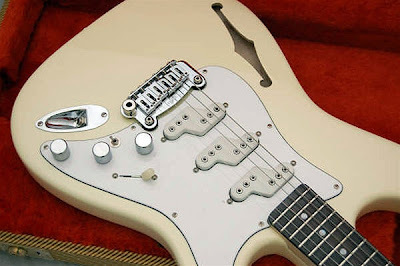 Stratoblogster recommends G&L Dealer GUITAR ADOPTIONS as a top online gear merchant with good deals, plenty of inventory and the knowledgeable personal service you'd expect from a hometown guitar shop. Check out all their lines!